Haven’t decided on a hotel yet? 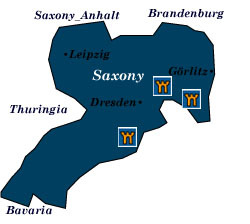 You can look at other available hotels in the Saxony region with Booking.com. Once a kingdom, a center of art and culture, a Prussian state, a war victim, the heartland of a failed communist experiment, and the heart of a long climb back to its former glory, today’s Saxony has much to offer its visitors. Castles and palaces, a region of natural wonders known as the Saxon Switzerland, and the cultural treasures of Dresden are just for starters. But it’s more than the visual, its great heroes, such as Bach, Wagner, Schiller, Goethe, and Luther, have become part of our world. Dresden For 800 years Dresden has witnessed the heights of artistic accomplishment in the 18th century and the depths of near annihilation in the last days of World War II. Fortunately, its cultural and artistic expression is back on the rise. Since German reunification, reconstruction has brought life back to many of its famous buildings. Frauenkirche Resurrected from the ashes, this church was rebuilt original-brick-by-original-brick to completely resemble the original. Katholische Hofkirche (Catholic Court Church) The largest church in Saxony, inside its crypt lie 49 rulers of Saxony. Residenzschloss This former royal palace is still undergoing restoration. A few of its finished rooms hold historical displays. Especially well known is the Neues Grünes Gewölbe or New Green Vault, which holds an outstanding collection of objets d’art made of gold, silver, and ivory, and precious and semi-precious stones, including the world’s largest “green 41-carat diamond.” And then there’s the Historisches Grünes Gewölbe or historical green vault with an additional 3,000 pieces of artwork. Semperoper (Opera House) Originally open in 1841, and twice rebuilt after destruction by fire and bombing, this opera house is one of Europe’s most dazzling. Richard Wagner, Carl Maria von Weber, and Richard Strauss debuted many of their works here. Museums: Albertinum Named after Saxony’s King Albert, this enormous imperial building holds a fabulous art collection of 19th- and 20th-century art and sculpture. Zwinger August the Strong, elector of Saxony, built this palace after the fashion of Versailles. Today, six museums offer a vast array of art. The most significant museum is the Gemäldegalerie Alte Meister or Old Masters Picture Gallery. Here you’ll find famous works by Raphael, Tintoretto, Vermeer, and Rembrandt. Cruises on the Elbe If you take a cruise on the historic Elbe all the way to the border of the Czech Republic, you’ll pass through gorgeous scenery and natural wonders of fantastic rockscapes, deep valleys, and hilltop castles in an area known as Sächsishe Schweiz or Saxon Switzerland. Especially noteworthy is the Festung Königstein, the largest fortress in Germany. A couple of palaces: Schloss Weesenstein High above the Müglitz River, this grand palace presents a fanciful mixture of Gothic, Renaissance, and baroque styles. A baroque pleasure palace in its heyday, Schloss Moritzburg now offers rich interiors, a fine chapel, and surrounding parkland for visitors to experience. Meissen Famed for its manufacture of Dresden porcelain, you won’t find any special deals here. The 15th-century Albrectsburg Castle was the site of the town’s first porcelain manufacturing. At the Porzellan-Manufaktur you can see how the porcelain process is done. Görlitz You can’t get any farther east than this noncommercial, beautiful town right on the border with Poland. Town architecture reflects the Gothic, Renaissance, baroque, rococo, and Art Nouveau style in its 4,000 historic houses. Bautzen High above a deep valley, this 1,000-year-old town is home to the Sorbs, Germany’s only indigenous ethnic minority. On a site where a series of castles have existed since the 7th century, Schloss Ortenburg houses a courthouse and a museum (the Sorbishes Museum), with exhibits displaying folk art and cultural artifacts of the Sorbs. Leipzig Saxony’s second largest city, vibrant Leipzig is the place to come for the German “scene,” a hipness of coffeehouses, clubs, and restaurants. The cultural life of Leipzig has always revolved around music, for it was here that Bach, Schubert, Wagner, and Mendelssohn found their inspiration. Today, you’ll find concerts and theater throughout the year. If you take time to explore the backstreets, terrific examples of Art Nouveau are hidden behind every corner. The Museum für Völkerkunde, or Ethnological Museum, has a fabulous collection of ancient Southeast Asian art. Or try the Musikinstrumentenmuseum (Musical Instruments Museum), which holds the world’s oldest clavichord (1543), as well as a wide assortment of instruments from the Renaissance. The Museum für Angewandete Kunst. 2,000 years of arts and crafts, including exquisite porcelain, tapestries, and modern Bauhaus designed art objects are showcased here. Museum in der Runden Ecke. Fans of spycraft will find much of interest in this former headquarters of the East German Stasi. See what it was like to live in the former GDR. Bach Museum. This reconstructed former home of J.S. Bach holds the largest Bach archives in Germany and has some fun interactive displays. Outside the center of Leipzig, the Schillerhaus is where Friedrich von Schiller wrote the “Ode to Joy” in 1785, from which Beethoven took inspiration for the final movement of the Ninth Symphony. Churches: Thomas Kirche. Bach worked as a cantor here for 27 years until his death in 1750. Beneath a bronze epitaph near the altar is his final resting place. Nikolaikirche. With Romanesque and Gothic exteriors and a Classical interior, the church was center stage in peaceful demonstrations that eventually brought down the communist GDR regime in 1989. Augustusburg This vast Renaissance schloss, or palace complex, houses a number of museums, including the Motorradmuseum which features a phenomenal collection of vintage motor cycles. Colditz Escape Museum is a former Renaissance palace, transformed at times into a hunting lodge, a mental hospital, and a high-security prison during World War II. Learn about the amazing and ingenious means of escape (over 300 attempts) the Allied officers imprisoned here resorted to.